Freeport, Maine – (October 24, 2018) Maine Beer Company of Freeport, Maine, announces their expansion into Florida with partner Cavalier Distributing. David and Daniel Kleban began Maine Beer Company in 2009 in Portland, Maine. They started with a one-barrel brewhouse and the mission of brewing one beer and brewing it well. “Spring Peeper” Pale Ale, which would later be renamed “Peeper” was the first beer produced. The “Do what’s right” philosophy the brothers began with would frame growth of the business that followed, focused around their role as a donating member of 1% for the Planet. As a member, Maine Beer Company has committed to donating 1% of their gross annual sales to environmental nonprofits. After expanding to a 15bbl brewhouse, the company had outgrown its original space and moved to a new facility in Freeport in 2013. Now in 2018, they have reached the next phase of their growth, transitioning to a 60bbl brewhouse in an expanded production facility, with a new tasting room slated for 2019. Throughout this, Maine Beer Company has maintained its goals of treating their employees well, taking care of the earth and the creatures that live on it, and always striving to make quality beer. 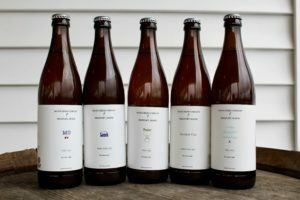 For the Florida launch, five of Maine Beer Company’s core brands will be available: Peeper, Lunch, MO, a tiny beautiful something, and Another One. Maine Beer Company’s East Coast take on a classic West Coast IPA. Lunch is named after a whale that has been spotted off the coast of Maine by Allied Whale (nonprofit partner) since 1982. She has what looks like a bite taken out of her fin, hence the name Lunch. Notes of tropical fruit, citrus fruit, pine, subtle malt sweetness. Named after Daniel’s twins, MO, a staff favorite, has notes of zesty citrus, passion fruit, pine, and a subtle malt sweetness. Maine Beer Company’s only single hopped beer showcases El Dorado hops. Notes of candied orange, citrus zest, subtle anise. While getting through the first expansion in 2013, sometimes we just needed Another One to keep the creative juices flowing. This IPA has notes of grapefruit, tangerine, and a resinous, clean malt palate.